Burton Albion manager Gary Rowett has turned down an approach from Blackpool, according to the League Two club, despite Belgian Jose Riga still being in charge at Bloomfield Road. Riga, 57, fell out with chairman Karl Oyston before the start of the season. 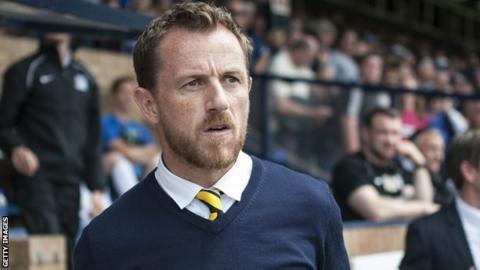 Rowett, 40, told the club website: "Following discussions with Blackpool, I have decided to remain at Burton Albion for the foreseeable future. "I feel as though it is not the right job for me at the present time." Former Charlton boss Riga took charge of the Seasiders in June and has only overseen six competitive matches so far. His tenure has been overshadowed by a lack of players at his disposal, after inheriting a first-team squad of just six when he was appointed, and subsequently clashing with Oyston over transfer targets soon after arriving. Blackpool only had eight professionals under contract two weeks before their first league game at Nottingham Forest and, despite signing 12 players in 12 days, they only had nine men eligible on the morning of the game. The Seasiders eventually managed to name four substitutes for the game, which they lost 2-0. They currently lie bottom of the Championship table, having also been dumped out of the League Cup by League Two side Shrewsbury. Burton's statement claims that Oyston approached chairman Ben Robinson on Monday for permission to speak to Rowett about their managerial position, which was granted, and subsequently Rowett met with Blackpool representatives on Tuesday. Rowett added: "We've made an excellent start to this season, winning seven out of eight games. "I feel we have an excellent group of players in the squad currently. I enjoy working with them immensely and this is a very exciting time to be involved at Burton Albion."